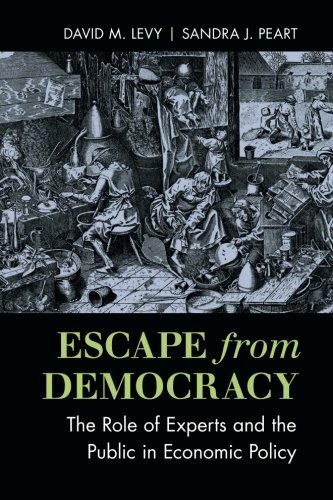 [PDF] Escape from Democracy: The Role of Experts and the Public in Economic Policy | Free eBooks Download - EBOOKEE! Description: The orthodox view of economic policy holds that public deliberation sets the goals or ends, and then experts select the means to implement these goals. This assumes that experts are no more than trustworthy servants of the public interest. David M. Levy and Sandra J. Peart examine the historical record to consider cases in which experts were trusted with disastrous results, such as eugenics, the regulatory use of security ratings, and central economic planning. This history suggests that experts have not only the public interest but also their own interests to consider. The authors then recover and extend an alternative view of economic policy that subjects experts' proposals to further discussion, resulting in transparency and ensuring that the public obtains the best insights of experts in economics while avoiding pitfalls such as expert bias. No comments for "[PDF] Escape from Democracy: The Role of Experts and the Public in Economic Policy".